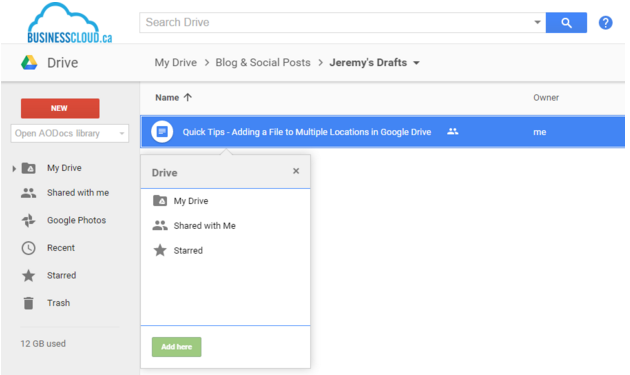 Adding a File to Multiple Locations in Google Drive | Business Cloud Inc.
Google Drive provides an effective way to collaborate as a team, and shared folders are an excellent example of this. When a file is moved into, out of, or within a shared folder, all collaborators of that folder can see this change. What if you’d like to access the file from a different location, but also have it exist in the original so that collaborators can still access it? 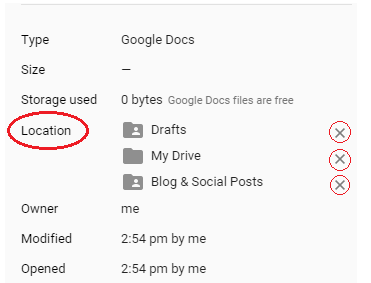 Luckily, Google Drive allows files to exist in multiple locations simultaneously. This means, for example, you could save an invoice in the Accounting folder, but also add it to Human Resources or Administration, and still have one version of the file exist. Select the file you wish to add to another location. Press SHIFT+Z on your keyboard. A dialog box will open next to the file. Browse to the correct folder and click the “Add Here” button. That’s it! Your file now exists in both locations and can be accessed by anyone shared to those folders. Select the file you wish to remove from a location. Click the View Details button in the top right of Drive if it is not open already, and make sure the “Details” tab is highlighted. Under the file details, there is a heading titled “Location”. The locations in which the file exists are listed here. To remove it from one (or more) places, simply click the X next to that location. Adding a file to multiple locations lets you use Google Drive to create views that are specific to you, or to boost the collaboration capabilities of your team. By the way, it also works with folders! I hope this was a helpful tip. Please check back every Wednesday for a new tip/trick from the Business Cloud team.